The "Go Green" Club, a guide to improving your personal environment has been created out of concern for the health of people like you. 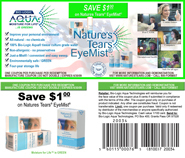 As a valued customer of Nature's Tears EyeMist, we are providing you with an educational tool to access your personal health. Improve your personal environment wherever you live. Discover how a healthy lifestyle is a GREEN lifestyle. Read about Health education / GREEN support. Find out about the worldwide humanitarian mission. Become part of the solution - for a healthier planet. July is Sight Preservation Month. What better time than now is there to join Bio-Logic Aqua Technologies "Go Green" club and movement? Also be sure to listen to The Sharon Kleyne Hour hosted by Sharon Kleyne, the founder of Bio-Logic Aqua Technologies. Click here to join the club!